Assessment by the selected independent ‘Certification Organisation’. Now you have achieved Compliance, you have extra tools to improve and to achieve your business objectives now and in the future. These are independent organisations assessed and registered by national Accreditation Bodies, who are members of the IAF (International Accreditation Forum) – UKAS in the UK and ANAB in the USA for example. Industry specific bodies such as Certification & Timber Grading Ltd, Print & Media Certification and Quality Scheme for Ready Mixed Concrete. 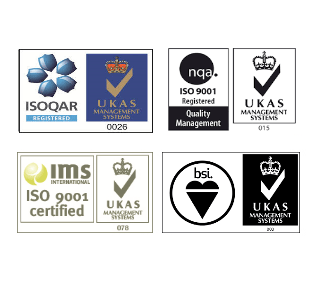 UKAS stands for the United Kingdom Accreditation Service which was founded by the UK Government (Department of Trade and Industry) to assess, audit and if successful, register Certification Organisations. Most countries have their own equivalent Government authorised Accreditation Body such as RAB in the USA , who are members of IAF (International Accreditation Forum) – to see their list of members is on their website at iaf.nu.. The Accreditation Bodies check and approve the Individual Certification Organisations like BSI, NQA, IMS and TUV.